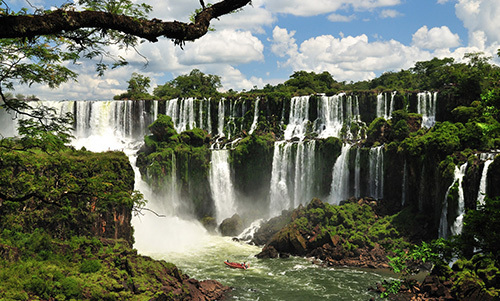 The waterfall system consists of about 270 falls along 2.7 kilometres (1.67 miles) of the Iguazu River. Some of the individual falls are up to 82 metres (269 feet) in height, though the majority are about 64 metres (210 feet). The Garganta del Diablo or Devil’s Throat (Garganta do Diabo in Portuguese), a U-shaped 150-metre-wide and 700-metre-long (490 by 2300 feet) cliff, is the most impressive of all, and marks the border between Argentina and Brazil. Most of the falls are within Argentine territory, but from the Brazilian side a more panoramic view of the Garganta del Diablo is obtained. Many islands split up the falls, including several large ones. About 900 metres of the 2.7-kilometre length does not have water flowing over it. The first European to find the falls was the Spanish Conquistador Álvar Núñez Cabeza de Vaca, after whom one of the falls in the Argentine side is named. The falls are shared by the Iguazú National Park (Argentina) and Iguaçu National Park (Brazil). These parks were designated UNESCO World Heritage Sites in 1984 and 1986, respectively. The name Iguazu comes from the Guarani words y (water) and guasu (big). The legend says that a god pretended to marry a beautiful aborigine named Naipú, who fled with her mortal lover in a canoe. In rage, the god sliced the river creating the waterfalls, condemning the lovers to an eternal fall. Iguazu falls are the second largest in the world after Victoria Falls in Africa and are deservedly one of the seventh wonders of the world. Their height isn’t so inspiring as is their length – the falls seem to go on and on in the distance. When the water level of the river is high, the whole ridge is almost covered in the huge expanse of water pouring over. At other times, when the river level is lower, the amount of water is less and trees are rocks jump out from the fall wall providing a beautiful break in the water. Their are multiple approaches to the falls, both from above and below. At some points you can get so close that you will feel the spray from the falls on your face. The Iguazu falls is formed at the edge of a volcanic flow where the rock suddenly changed hardness and wore away. What’s sad is there was a second, even larger, fall that was destroyed when the river was dammed. Besides the falls, you can enjoy a walk through the bush where you will be delighted with sights of monkeys and tucans playing in the forest. For those who would like to see the falls from both sides, it is only a short taxi ride across the border to Brazil. It is suggested that the Brazil side should be seen first, as, although stunning, is not quite as awesome as the Argintinian side, and this way leaves the best until last. You should give yourselves at least half a day on each side and preferably more.